Parowan Gap (between arrows), Iron County. Oblique view looking east-southeast. GoogleEarth image. Scale varies in this perpective. Even though we are a “desert” state, Utah’s rivers are world-renowned among river runners and geoscientists. Several of America’s early geologists, including G.K. Gilbert, W.M. Davis, C.E. Dutton, and J.W. Powell contributed to theories of stream evolution from observations made in Utah. Rivers typically originate in the mountains, flow away from them in a more-or-less constant direction, enter increasingly broad river plains, and terminate at an ocean. But many rivers in Utah flow toward and across mountains, run contrary to valleys, make U-turns, and many never reach the ocean. Over long time spans, rivers tend to change course in response to tectonic processes (such as rising mountains and lowering basins) or changing climate. Streams can also adjust their course rapidly, sometimes instantaneously, in response to catastrophic events such as flooding, volcanic eruptions, landslides, earthquakes, or by stream capture (stream “piracy”), where a river intercepts a neighboring river and diverts or “steals” water from its drainage basin. Whether the changes are fast or slow, water needs to flow downhill, but in some places a river’s seemingly bizarre behavior can leave one struggling to come up with a reasonable explanation! All three of Utah’s physiographic provinces—Colorado Plateau, Rocky Mountains, Basin and Range—have textbook examples of streams that exhibit anomalous courses. Within the Colorado Plateau, for example, the Paradox Basin is named for the Colorado River’s paradoxical pattern of flowing perpendicular to valleys and faults. This is largely due to the presence of thick layers of salt buried beneath other layers of sedimentary rock. In the Rocky Mountains, there are numerous well-known examples of rivers that run directly across mountain ranges. This phenomenon can arise when river erosion exhumes buried geologic structures, and the river subsequently cuts down through them while maintaining its prior course; these are known as “superimposed” streams. Another case of mountain-dissecting streams is “antecedence,” where mountains rise and pre-existing streams cut into them as quickly as they rise, the streams again maintaining their original course. Finally, no major streams in the Utah part of the Basin and Range Province make it to the Pacific Ocean, instead emptying into closed basins of the west desert, but this has not always been the case. The following are a few of the numerous occurrences of Utah streams that run extraordinary courses. After emerging from a canyon carved into sandstone bedrock, the Colorado River flows westward across the marshy northern end of Moab Valley. Then, in defiance of the imposing sandstone cliffs on the west side of the valley, the river turns toward the cliffs and flows into them at The Portal, continuing on its way through another sandstone canyon. The Portal is perhaps the most striking example of the Colorado flowing across, rather than along, valleys within the Paradox Basin. The elongate valleys of the Paradox Basin are the result of subterranean salt, originally deposited through evaporation of seawater in a shallow embayment some 300 million years ago, leaving behind the ocean salts. During burial, the low-density salt was squeezed and flowed upward to form diapirs (masses of salt that pierced or intruded the overlying strata) or walls of salt up to 2 miles thick. The valleys form as the underlying salts dissolve, and the overburden collapses in a process known as “salt tectonics.” The Colorado River, indifferent to the sinking valleys beneath it, maintains its original course. The Uinta Mountains once separated the drainages of the two largest rivers in Utah, the Green and Colorado Rivers. Previously, the Green had flowed eastward to join the greater Mississippi River drainage system, which empties into the Gulf of Mexico, and the Colorado flowed southward to empty into the Gulf of California. Now, the Green flows toward the Uintas, then parallels them, and then turns and crosses their eastern flank, eventually joining the Colorado River in Canyonlands National Park. 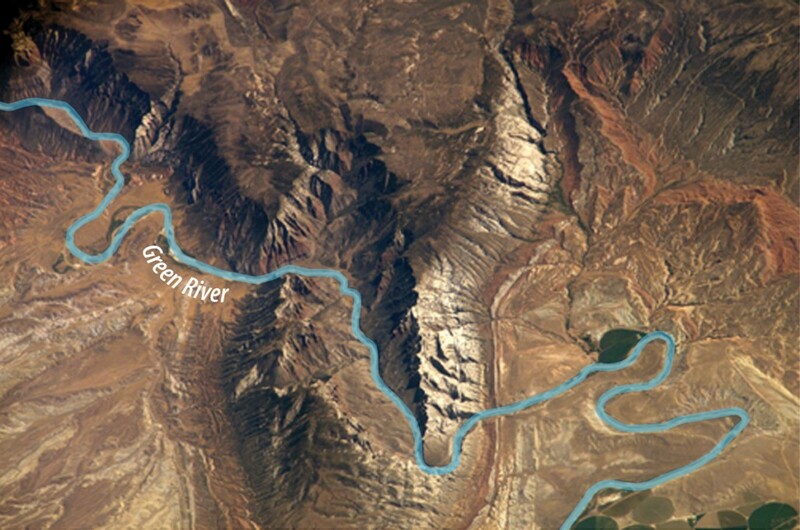 The modern cutting of the Green River through the eastern Uintas intrigued geologist and explorer John Wesley Powell, and has been described as the “classic conundrum” of drainage anomalies. Although the story is complex and not fully understood, a combination of antecedence, superimposition, and stream capture is suspected. Regardless of the mechanism, the union of the Green River Basin in southwestern Wyoming and the Colorado River drainage greatly energized the entire stream system, causing it to erode the spectacular canyons of Dinosaur National Monument (Canyon of Lodore, Whirlpool Canyon, Split Mountain Canyon). Farther downstream, increased discharge also contributed to the incision of the amazing canyons of the Colorado Plateau. Parowan Gap, the product of a bygone stream, is a 600-foot deep canyon carved into the Red Hills northwest of Parowan. 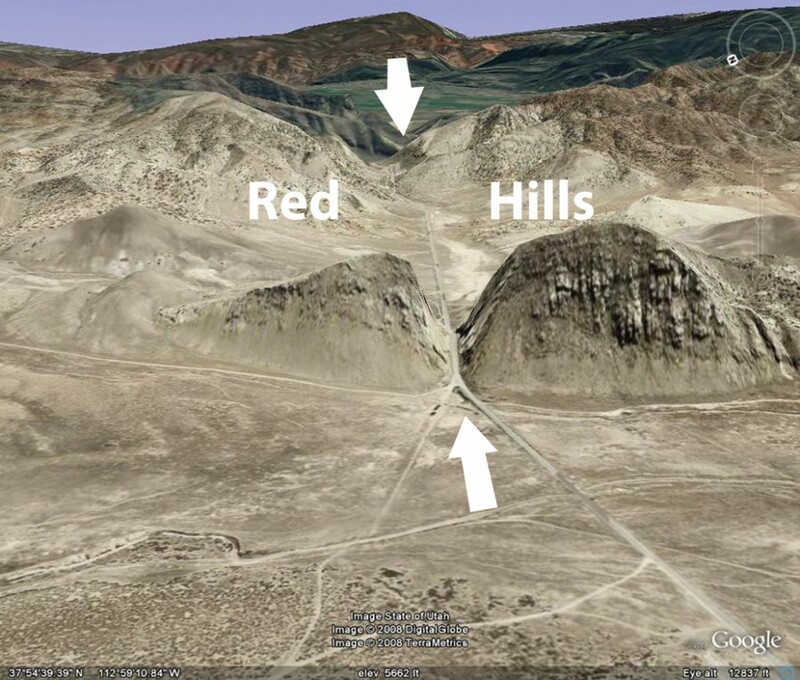 Millions of years ago, the hills began to rise as a result of fault movement, and the stream eroded the Parowan Gap canyon across the emerging ridge. An often-used analogy is that of a buzz saw (the river) slicing a groove (Parowan Gap) into a log rising up from below (the Red Hills). Similarly, the Provo, Weber, and Ogden Rivers are actively cutting canyons across a rising Wasatch Range. Like the river that bisected the Red Hills, these rivers are antecedent to the range and eroding into the rising mountains. The Bear River is the longest continuously flowing river in North America that does not reach the ocean. The Bear River’s headwaters are in Utah’s Uinta Mountains; the river then flows into Wyoming, back into Utah, back into Wyoming again, into Idaho, and then returns to Utah where it drains into Great Salt Lake. After traveling a several-hundred-mile horseshoe-shaped course, the river ends only about 90 miles from its source. Yet, water of the ancestral Bear River did reach the ocean when it was a tributary of the Snake River, flowing into the Columbia River and on to the Pacific Ocean. Eruption of lava flows in southeastern Idaho diverted the Bear into the Great Salt Lake drainage basin, which has been the river’s terminus for the past 50,000 years.